Investors will have to wait until next week to see if the S&P 500 can finally top 2,000. Stocks fell broadly on Friday. 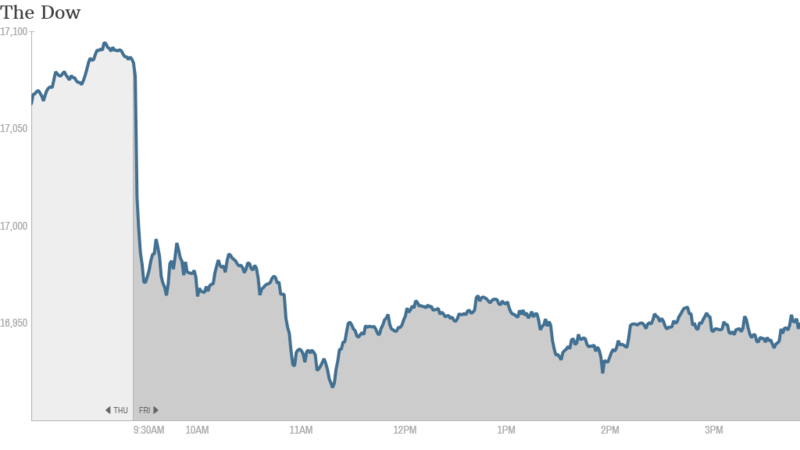 The S&P finished the day down about 0.5% The Dow fell almost 130 points, or more than 0.7%. Visa (V), which has the biggest weighting in the Dow, dragged down the blue chips with its 4% drop. The Nasdaq fell too, largely due to an almost 10% drop in Amazon (AMZN) following its latest earnings. Despite Friday's declines, it wasn't that bad of a week for stocks. The Nasdaq, S&P 500 and Dow ended the week mostly unchanged. Here are some highlights from Friday's trading. Amazonian drought: Amazon's sales jumped more than 20% but it also reported a $126 million loss. Some investors may be growing tired of Amazon's long history of quarters where it loses more than expected due to big investments. The company has been spending a lot this quarter, unveiling products and services like the Fire TV, Fire Phone and Sunday delivery, but it seems that's not enough to keep some investors around until next quarter. 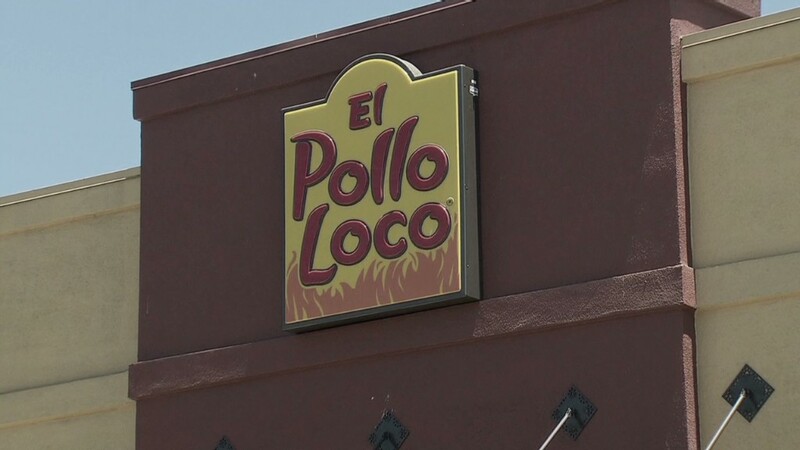 IPO Loco: It was an amazing debut for El Pollo Loco (LOCO), whose shares surged 60% from their offering price of $15. The company has a lot of debt and isn't exactly Chipotle (CMG), but it has ambitious expansion plans and healthy IPO market behind it. Related: Are healthy chicken and a tiny profit enough to take El Pollo Loco nationwide? A few other companies debuted today, but none had El Pollo Loco's spark: Orion Engineered Carbons (OEC) and was down slightly. Ocular Therapeutix (OCUL) and Advanced Drainage Systems (WMS) rose modestly. Innocoll (INNL) was flat. Cynk sinks: Cynk Technology (CYNK), the mysterious social network with no earnings, revenue or even assets, is once again trading after the SEC suspended trading two weeks ago following a from-nowhere 25,000% price increase. The stock was down 85%. Fox aims sky-high: 21st Century Fox (FOXA) merged its BSkyB cable assets in Germany and Italy with BSkyB in England, freeing up $8.3 billion in cash. The market thinks that the money might be put to use to help Rupert Murdoch's Fox make a higher bid for Time Warner (TWX), which Fox has sought to buy for $80 billion. Time Warner turned down the offer. Fox shares were flat and Time Warner shares were up 1.2%. Several other stocks caught up in merger speculation were on the move as well. After rumors of a potential tie-up between Zillow (Z) and Trulia (TRLA) began swirling yesterday, both stocks surged. The rally continued Friday with Zillow up 9% and Trulia almost 5% higher. SodaStream (SODA), which soared Thursday on reports it may look to go private, wasn't so lucky. The stock fell more than 1%. Other stock movers: Visa is having one of the worst days in the S&P 500 behind Amazon. It had a great quarter that exceeded expectations and even spurred a number of price target upgrades from analysts. But it lowered its revenue growth forecast, and it's getting punished. Rival MasterCard (MA), whose earnings come out in a week, was down 2%. Starbucks (SBUX) also reported a good quarter. But its shares fell 2% despite a positive outlook from CEO Howard Schultz. Matt Peron, managing director for equities at Northern Trust Asset Management, said the pair were victims of uncertain investors looking to escape an anticipated downturn. "People take a glass-half-empty view, then when it's risk back on they'll come back to those names," he said.